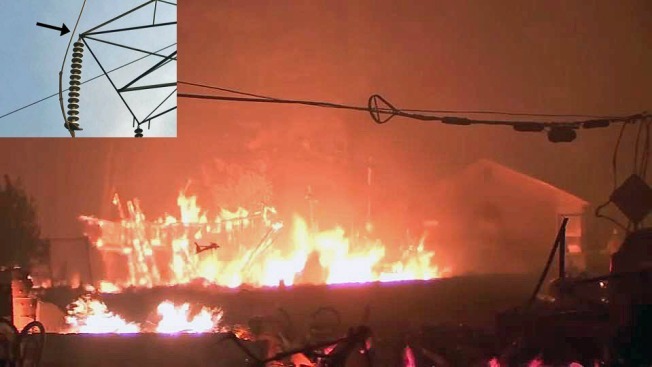 NBC Bay Area has learned that authorities investigating the deadly Camp Fire have tied its origin to the failure of a single steel hook that held up a high voltage line on a nearly 100-year-old PG&E transmission tower. The fire began at the base of a transposition tower, which serves to redistribute the electricity on the system to balance the load and assure safety. The tower has two arms holding out the “jumper,” a part of the line that’s being shifted to another point at the top of the tower. The arms each hold electrical insulators, which resemble a series of white discs. Authorities believe the fire started with the fracturing of a steel hook that holds up the insulators to the arms above. It is one of those hooks, sources with knowledge of the investigation say, that failed in high winds the morning of Nov. 8. “PG&E failed to maintain the tower, and they have an obligation to do that -- and it means they are liable for this disaster,’’ said attorney Dario de Ghetaldi, who is suing the utility over the fire. But Frank Pitre, another attorney who has sued over both wildfires and the San Bruno gas explosion, worries the hook failure is just more evidence that PG&E is simply not able to deal with the risk posed by its system. “That’s a red flag,” he said, a warning that parts of the system could fail due to corrosion and fatigue from decades of service.